Alexa told me in early 2017 that Pizzagate was a debunked conspiracy theory, so I guess that settles it … ​sooo … why the ongoing cover up? ​As usual, the serious evidence was never honestly examined by the mainstream media, but let’s not try to sort through it here. Let’s instead look at the only mainstream journalist, Ben Swann, who did an honest report on Pizzagate. That was in January of 2017. He disappeared the day after it went viral. His Facebook page … gone. His Twitter account … gone. His YouTube channel … gone. Two weeks after the vanishing, I talked to Derrick Broze in Austin Texas, and he said that he knew Ben Swann personally and that Ben was doing fine. That's all he would say ... and yet ... that is more than I could find online about it. I could not find any statement from Ben Swann himself. Ben Swann had millions of fans outside of his local region as a result of his professional and well substantiated investigations into controversial issues that other so-called journalists were afraid to investigate honestly. He would challenge the propaganda and coverups in the mainstream narrative. He was thus well known among the millions who know that the mainstream narrative is often not true. Then, he suddenly stopped producing content that his national and international fans cared about, and his social media presence was simultaneously deleted. His national and international fans did not know he was also a local news anchor in Atlanta, and thus fans have had difficulty finding any evidence that he is still alive other than the occasional online comment that he was seen doing local news … as if nothing happened. Naturally that sounds pretty hard to believe, so I checked it out myself, and it took about 30 minutes of effort, which is about 29 minutes more than it should have taken, and which is far more than most people would be willing to do, so for all practical purposes, he was hidden from the rest of the nation. Nevertheless, the screen capture below shows that he did a story on local news on 11/20/2017. 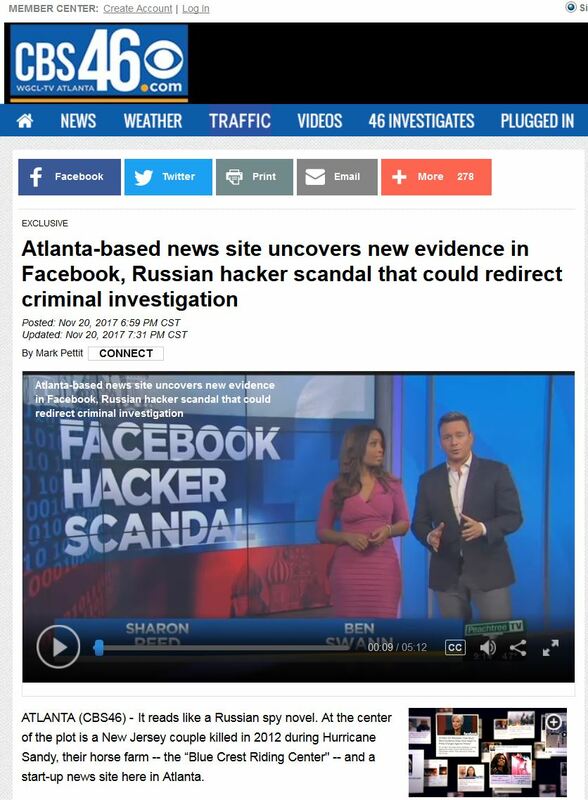 Far from challenging the propaganda and coverups in the mainstream narrative, this story from 11/20/2017 is propaganda perpetuating the ludicrous mainstream narrative that "the Russians" got Trump elected. Those who followed his work will know that ... that’s just creepy ... as if he has been replaced by a pod person like in the movie "Invasion Of The Body Snatchers". ​By all appearances, he sold out, so if he expects anyone to trust him again and not assume he is controlled opposition​, he will have to come clean and make a compelling and verifiable argument about why he and his friends have acted in such a suspicious manner. Update 2/6/2018: Ben Swann has resumed his YouTube account and is doing Reality Check segments again, but his fans can't produce any evidence that he ever came clean about the suspicious behavior from him and his friends a year ago, or about his recent story promoting the "Russians did it" narrative. In fact, so great is their faith that his fans are quite hostile to anyone who does demand that he come clean​. Of course, by advocating faith over critical thinking skills, his fans are not making him look good.